Escape the urban bustle at Blue Mountains and Dolphin & Whale Watching. Discover out-of-the-way places like Kiama Blowhole and Speed Boats Tours. Change things up with these side-trips from Sydney: Lincoln's Rock (in Blue Mountains National Park) and Katoomba (Wentworth Falls & The Three Sisters). There's much more to do: kick back and relax at Bondi Beach, hike along The Opera House to the Botanic Gardens Walk, admire the natural beauty at Royal Botanic Garden Sydney, and wander the streets of The Rocks. Madrid, Spain to Sydney is an approximately 25-hour flight. You can also do a combination of flight and bus; or do a combination of flight and train. The time zone difference moving from Central European Time (CET) to Australian Eastern Standard Time (New South Wales) (AEST) is 9 hours. When traveling from Madrid in August, plan for much colder days and a bit cooler nights in Sydney: temperatures range from 22°C by day to 11°C at night. Wrap up your sightseeing on the 11th (Sun) early enough to travel to Brisbane. 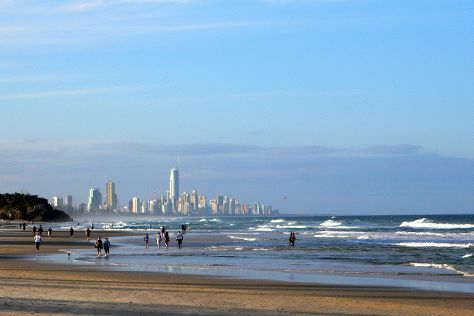 Step off the beaten path and head to Kings Beach and Coolangatta Beach. You'll get in some beach time at Burleigh Heads Beach and Kirra Beach. Explore Brisbane's surroundings by going to Maleny (Obi Boardwalk & Mary Cairncross Scenic Reserve), Scuba & Snorkeling (in Mooloolaba) and Slideways - Go Karting Gold Coast (in Nerang). Spend the 19th (Mon) observing fascinating marine mammals with a dolphin and whale watching tour. The adventure continues: explore the striking landscape of Burleigh Head National Park, identify plant and animal life at Lone Pine Koala Sanctuary, take in nature's colorful creations at City Botanic Gardens, and enjoy breathtaking views from SkyPoint Climb. For where to stay, ratings, and tourist information, read our Brisbane road trip site . Traveling by flight from Sydney to Brisbane takes 4 hours. Alternatively, you can do a combination of flight and bus; or drive. In August, daytime highs in Brisbane are 25°C, while nighttime lows are 11°C. Finish your sightseeing early on the 19th (Mon) to allow enough time to travel to Cairns. Get in touch with nature at Atherton Tablelands and River Rafting & Tubing. You'll explore the less-touristy side of things at Agincourt Reef and Trinity Beach. Explore the numerous day-trip ideas around Cairns: Port Douglas (Safaris & Spas), Daintree National Park (in Cape Tribulation) and Hartley's Crocodile Adventures (in Palm Cove). Spend the 20th (Tue) among aquatic life with a scuba or snorkeling tour. There's still lots to do: take a memorable tour with Tours, look for all kinds of wild species at Australian Butterfly Sanctuary, take in the architecture and atmosphere at St Monica's Cathedral, and take some stellar pictures from Glacier Rock Lookout. To find other places to visit, ratings, traveler tips, and more tourist information, refer to the Cairns trip planning app . Traveling by flight from Brisbane to Cairns takes 5.5 hours. Alternatively, you can do a combination of bus and flight; or drive. In August, Cairns is somewhat warmer than Brisbane - with highs of 31°C and lows of 20°C. Finish your sightseeing early on the 27th (Tue) to allow enough time to travel back home.